I cannot get enough of communicating with animals. Animal communication is one of the most valuable things I do. I love it because it challenges my assumptions about them time and time again. I am deeply passionate about increasing people’s awareness of animals as intelligent sentient beings. There is nothing less about a dog, a horse, a rabbit. Just as much design has been put into these animals as has been invested in the human form and yet we are so disconnected from the natural world that we can only see our own superiority to the point where modern culture thinks animal communication is impossible or pointless.. Animals are a huge part of my life. My family and I share our lives with four horses, two pigs, four dogs, four cats, two goats, a tremendous number of guinea pigs, rabbits, ducks and chicken. Animal communication has become part of my life, using skills that all humans possess. All of us can develop these animal communication skills if we are sufficiently interested and dedicated. 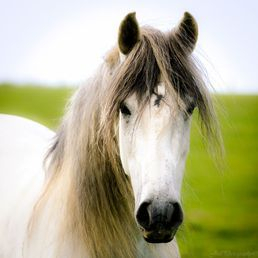 Horses are my respected colleagues in my work as Equine Guided Educator and I am astounded time and time again by their amazing ability to know what is going on inside us. I have seen them treat my clients with the deepest compassion and sensitivity and change their behaviour the instant we change a thought or attitude. I have communicated with all sorts of animals: rats, goats, dogs, cats, horses, etc. Each of these animal communications I have found fascinating. Expect to have a few of your preconceived ideas challenged! I certainly have! It is my experience that there is a universal language that all beings understand. The way I explain this to my students is to introduce the notion of the “thought before the thought”. This is the fraction of time between a thought arising and it becoming verbalised in our minds. For instance, imagine that you are standing on the pavement and suddenly you see a loved one on the other side of the road. Your loved one begins to cross the road to come to meet you. Suddenly you notice a car coming and realise that it is not safe for your loved one to begin to cross. An impulse arises in you before you manage to say “STOP!”. The moment in time at which that impulse becomes formed in your belly before it makes its way up to your throat to become verbalised as “STOP!” is the moment in time when an animal will immediately register your signal. This is how a medium receives information from a spirit contact and how they are able to communicate with those whose native tongue is different to their own. As an animal communicator, I have often thought about how animals communicate with me in the English Language and so far the best explanation that I have, is that I have a translator in my mind that instantly translates from the thought impulse, the pre-word thought to a word thought. Of course, animals also communicate to me with sensations that I receive in my body. I am not sure that the animals are always sending these to me on purpose or whether I just pick them up from tuning into the animal’s energy body during a communication. Either way, I will feel these sensations in my own body as if they are my own. The only way that I know that they are not, is when I have the thought, “Ah, this is not mine..” and then the sensation disappears. Animal communication is about letting go of the ‘thinking mind’ and tuning into the ‘feeling’ heart. All of us possess the ability to pick up on another’s emotions and thoughts and indeed do so throughout our daily lives, though not always consciously. In fact, many people actually find it hard NOT to pick up on another’s emotions – how many times have you entered a room and ended up with a knot of tension in your stomach because someone else was tense? Do you find it difficult to shake off another’s negativity? You are already using telepathy or empathy!